Update: In a statement made Monday evening, Remnick announced he had “changed his mind” following the backlash to his decision to interview Steve Bannon for The New Yorker Fest. “I don’t want well-meaning readers and staff members to think that I’ve ignored their concerns. I’ve thought this through and talked to colleagues — and I’ve re-considered. I’ve changed my mind. There is a better way to do this.” The announcement was made after a number of other headliners took to Twitter to back out of their own appearances at the festival, and after Remnick had reportedly received a lot of feedback from readers and his own staff. Director Judd Apatow urged The New Yorker to cancel Bannon’s appearance while announcing he would not appear at the same festival as him. Jack Antonoff, Jim Carrey, and Patton Oswalt all announced they would also no longer be appearing at the festival on Twitter, though they were far more brief. But many questioned whether Bannon, someone who no longer works in the White House and whose sole claim to relevancy is getting this kind of media attention, is worth attempting to corner. Director Ava DuVernay lamented that the magazine was selling tickets to see a man who had helped white nationalists reach the mainstream. Author Roxane Gay wrote that an invitation to Bannon from a publication with the prestige of The New Yorker, even for a contentious debate, only legitimizes him. Giving Bannon a platform like this, with the imprimatur of The New Yorker, provides him with further legitimacy. It emboldens him and his ilk. And those of us who object are told we're just angry instead of wide awake. Bravo to everyone involved. 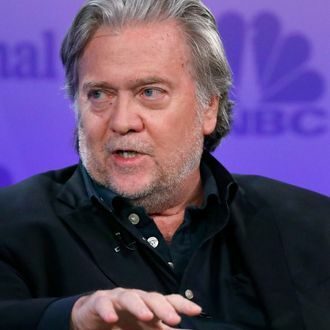 Numerous others aired their disdain for Bannon’s inclusion in the festival, including staff writers at The New Yorker and elsewhere. Imo, it would be fine for the New Yorker festival to host a hostile interview with Stephen Miller, since that fascist is an active public official who would remain powerful and relevant without any media attention. Bannon invite is harder to understand. You have to be very boring or very stupid to think that Steve Bannon is interesting or smart. A garbage bag full of ice-cold gin wrapped in four barn coats, sweating profusely while trying to explain the plot of a racist French novel. Fantastic stuff.